Luc Robitaille scored his 500th goal on Jan. 7, 1999, but it wasn't until a couple of days later, when he received a fax from Phil Esposito, that he realized the gravity of the accomplishment. "I remember thinking, 'Whoa, that's pretty cool!' I'm part of the 500 club, you know? I didn't know there was any club, but I knew what he meant. That's a very special thing." The high-water mark was just one in a career full of them for Robitaille, who retired as one of the most gifted goal scorers of his -- or any -- generation. "Lucky Luc" finished his career at No. 10 on the all-time list with 668 regular-season goals, a retired jersey in the Staples Center rafters and a 2009 induction into the Hockey Hall of Fame. It was a decorated career, but one that almost never got off the ground. Because of his perceived deficient skating ability, Robitaille dropped to No. 171 in the 1984 NHL Draft, where he was taken by the only team he had contact with: the Los Angeles Kings. Two years later, in 1986, he earned a spot on the team's NHL roster. "I was so happy to be in the NHL that I was going to do whatever it took to stay," Robitaille said. "I was desperate, I was not going to let anything … I remember Marcel Dionne asked me, 'If you make it, where do you want to live?' And I told him the boardinghouse, because I didn't want to think about anything besides playing hockey." That single-minded approach paid off immediately, as Robitaille scored 45 goals to win the Calder Trophy in 1987. He proceeded to score at least 40 goals for the next seven seasons, including 63 goals and 62 assists in 1992-93, a season in which he outperformed his longtime linemate, Wayne Gretzky. "Gretzky was my idol," Robitaille said. "When I got to play with him, I was enamored. I was almost embarrassed to ask for the puck. But after that, it settled down. I started watching him and wanted to learn so much from him that it was absolutely incredible." While the Montreal native's scoring prowess gave the idea that finishing came naturally, his unique training regimen would suggest otherwise. "After every practice I'd practice one-timers, breakaways," Robitaille said, "and I would practice, tell a defenseman to get at the blue line and have him shoot 100 pucks and I would try to stop it with my stick. I wouldn't try to tip it, I'd try to stop it, because my theory was if I could stop it here, then in the game I'm not going to try to stop but it would be easier to tip it." Goal No. 500 -- against Buffalo and goalie Dwayne Roloson -- came in typically clinical fashion: a one-time snipe from below the right circle off a pass from Rob Blake. "It was one of those games when everything was clicking," Robitaille said. "You start the game and you're in that zone and everything seems to be going really good. I don't think I had been waiting a while (to score No. 500), but Rob Blake said 'Let's get it done!' He wanted me to get it going, he kept feeding me one-timers." 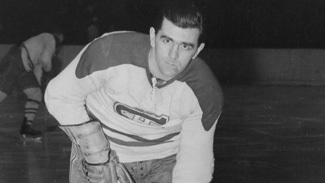 The next season, when Robitaille was closing in on Maurice "Rocket" Richard's mark of 544 goals, a French-Canadian reporter asked him what it felt like to approach the Rocket's record. "I remember, I froze," Robitaille said. "At the time I almost didn't feel like it was right to pass Rocket Richard. It was a very, very humbling moment. That took me aback, to be near Rocket Richard. ... Growing up in Quebec, the Rocket is our Babe Ruth. So it didn't feel quite right to me."